Well, not just today. But especially today. I've always thought that out of all the places I've lived in these United States, good ol' Erie, Pa. is the most giving. The generosity of people in this town with both their time and their treasure never ceases to amaze me, and it's days like the Erie Community Foundation's 3rd annual Erie Gives Day that reinforce my belief. And today, August 13, 2013, is that day. Here's how it works. 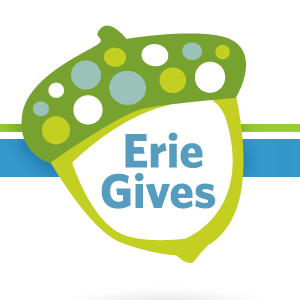 Visit www.ErieGives.org between the hours of 8 a.m. and 8 p.m. today only, and make a donation of at least $25 to one of over 300 worthy area non-profits. Donate as much money as you would like to as many nonprofits as you would like with your Visa, Mastercard, or Discover card, and then, watch the magic happen. According to the Erie Gives website, "The Erie Community Foundation will enhance each donor's gift by providing a prorated match to each gift made to a nonprofit. The Foundation will divide a total of $150,000 ($100,000 provided by The Erie Community Foundation plus an additional $50,000 provided by GE Transportation) among the participating nonprofits. The more a nonprofit raises the more of the $150,000 the nonprofit will receive." As if that's not magical enough, some employers in the area have a matching gifts program – ask yours if they do; they may match a portion of your donation to your beloved nonprofit, stretching your tax-deductible charitable donation even further. Many of the organizations involved in this year's Erie Gives Day receive a substantial chunk of their funding from this yearly event; if you appreciate the value of their contribution to our community, show them just how much by making a little contribution of your own. But don't dally – Erie Gives Day ends at 8 p.m. tonight, so you might as well just go there now.